Taking Pediatric Vision to the next level. We are proud to be the first and only vision center in Summerville and North Charleston to develop a pediatric clinic dedicated to the ocular health needs of those under the age of 10. Ocean Eye has a wonderful reputation for providing unsurpassed customer service and superior product quality and we bring this same dedication to our pediatric vision center. With pediatric vision benefits becoming mandatory under the Affordable Care Act (ACA), isn’t it nice to know that Ocean Eye has been dedicated to your children’s vision for years? Children require precise binocular vision to ensure that their visual system develops properly. Our thorough pediatric eye exams ensure that your child maintains the precious vision that so many adults take for granted. 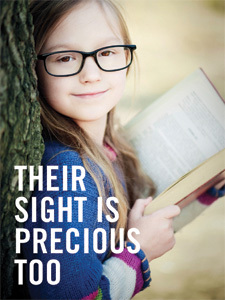 The American Optometric Association recommends that children receieve comprehensive eye exams at the ages of 6 months, 3 years, 5 years, and every 1-2 years while in school. We look forward to serving the eye care needs of your children through annual eye health exams, glasses, contact lenses, and basic vision therapy. If you have any questions, please do not hesitate to call our office.